USTA CAZ juniors had a strong weekend in late February at the USTA National Open Boys and Girls 12s/14s competition in Claremont, Calif. In Girls’ 14s, Alexandra Letzt of Scottsdale was able to claim third place. She also reached the semifinals in doubles with partner Jessica Failla (Ramona, Calif.). 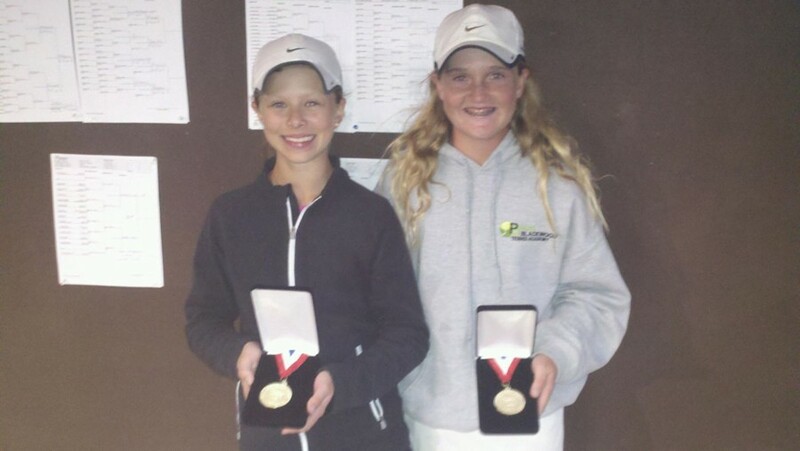 In Girls’ 12s, Tempe’s Delaney Nothaft (right, in picture) captured the doubles crown along with Michaela Gordon of Los Altos Hills. Calif. The third-seeded duo breezed through three matches, including an 8-0 final-round drubbing of Isabella Lorenzini (Clarendon Hills. Ill.) and Nami Otsuka (Norcross, Ga.). Kylie McKenzie (Anthem, Ariz.) picked up third place in doubles with partner Riley McQuaid (Tustin, Calif.). In a National Open Boys/Girls 18s event in Palm Desert, Calif., Jason Jaruvang (Phoenix) and Nicolas Montoya (Scottsdale) both reached the Round of 16 in singles and that duo also reached the quartefinals in doubles. On the girls’ side in Palm Desert, Calif., Stephanie Vlad (Scottsdale) reached the quarterfinals in singles, whie Zaina Sufi (Tucson) reached the Round of 16. In San Antonio at a Girls 16s event, Tucson’s Rachana Bhat reached the Round of 16 in singles and finished third in doubles with Aleeza Kanner (Phoenix). Other Southwest juniors who shined included Robert Seby (Oro Valley), who captured the singles and doubles titles in Boys’ 14s, and Maddie Pothoff of Tucson, who reached the finals of the Girls 14s before falling to seventh-seeded Maia Magill 6-3, 6-2. Potfhoff had won four matches prior to that round, including an upset of No. 2 seeded Amber Park.